Some 12,000 records from the Registers of St Patrick's Cathedral in Dublin, 1677-1800, have been added to Find My Past Ireland. Most of the entries in the registers are burial records. This is because, in the late 17th century and the 18th century, the area around St Patrick's was poor and considered unfashionable so it would not have been considered a great place to celebrate a wedding or christening. However, the registers include some of Dublin's most eminent citizens, including Jonathan Swift, numerous Archbishops and many honourable clergymen. The Cathedral also catered for the French Huguenot Congregation in Dublin, who worshipped in the Lady Chapel and were buried in the French Churchyard. 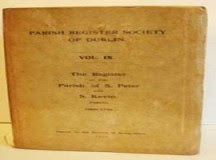 Published in 1907, these records were transcribed by the then Dean's Vicar of the Cathedral, C. H. P. Price, and edited by J. H. Bernard, the Dean of St. Patrick.